Austentatious is saddling the horses for a Grand Tour of the United Kingdom! Austentatious is an improvised comedy play starring a cast of the country’s quickest comic performers. 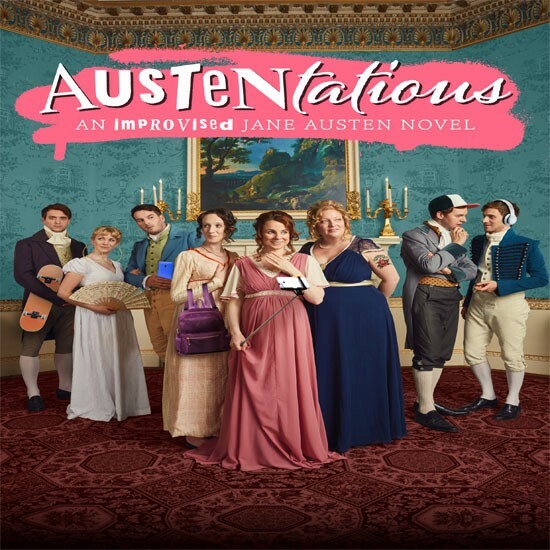 Every single show the cast conjures up a brand new ‘lost’ Jane Austen novel based on nothing more than a title suggested by the audience. The show comes fresh from six sellout runs at the Edinburgh Fringe, a weekly residency in London’s West End and a BBC Radio 4 special to mark the bicentenary of Austen’s death. Now their show will be appearing at two dozen theatres across the country to entertain and astonish audiences in equal measure. Previous ‘lost’ masterpieces have included Sixth Sense & Sensibility, Double 0 Darcy and Mansfield Shark, and no two shows are ever the same. Performed in period costume with live musical accompaniment, this is a Regency treat guaranteed to delight Austen novices and die-hard fans alike.